There is nothing mediocre about Zappshelter. There is no other structure that boasts such a range of practical permutations and possibilities. The only limit for Zappshelter is the confines of the imagination. The rest is pure Sheltology®. 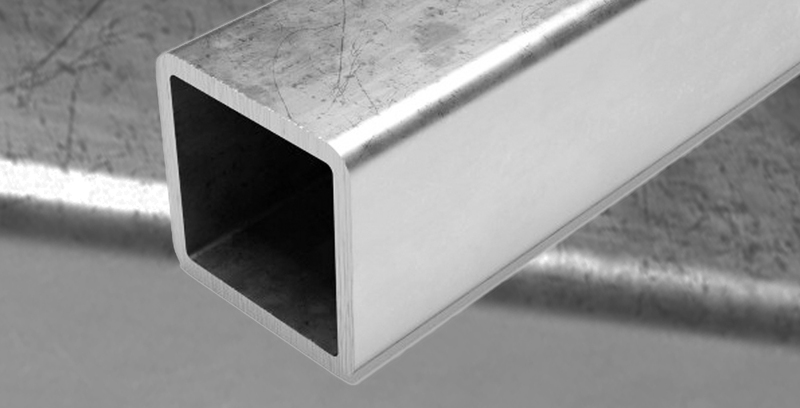 The strength and resilience of our structures is of great importance to us, and that’s why we only used the finest grades of high-tensile steel. Our steel is incredibly durable, performs well under continuous tension and provides enough flexibility in its composition to avoid breaking or cracking in extreme conditions. 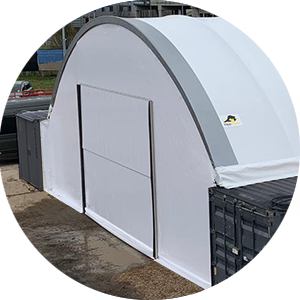 The sections are galvanised for extra durability and longevity, meaning your Zappshelter can take whatever the elements can throw at it. 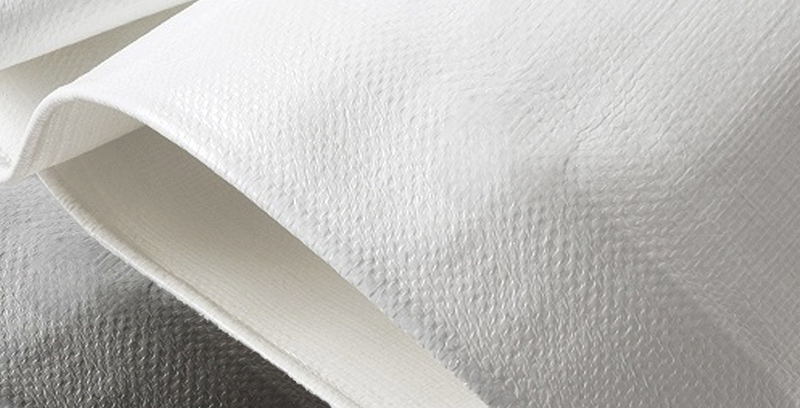 The fabric used in a membrane structure determines its long term success. We use the finest quality double-woven co-polymer fabric developed specially for this application and designed to perform in extreme climates. The critical factor for any such fabric is its ability to perform under constant tension, and ours outpaces any other. 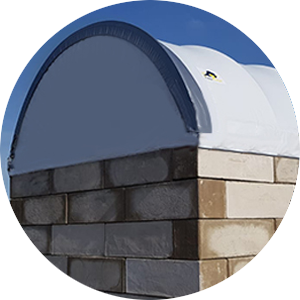 With built-in UV resistance and with a dirt-repellent surface, your Zappshelter will continue to look great for many years to come. No one can control the weather, and it continues to be the single-most challenging factor in construction today. 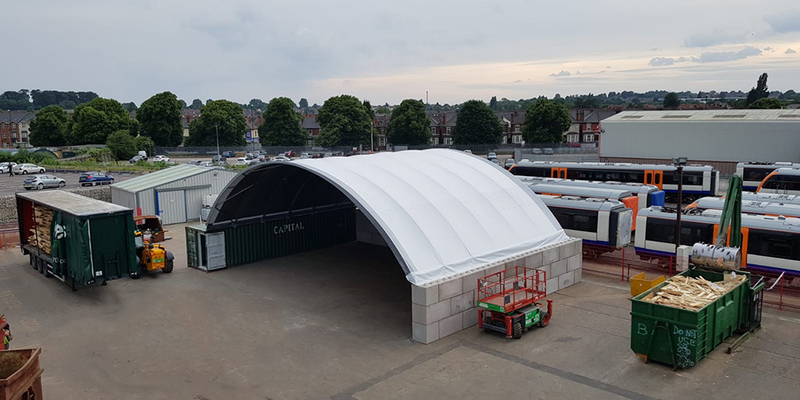 The safety of Zappshelter structures is no less important which is why they have been subjected to detailed structural analysis and on-site inspection by British structural engineer. 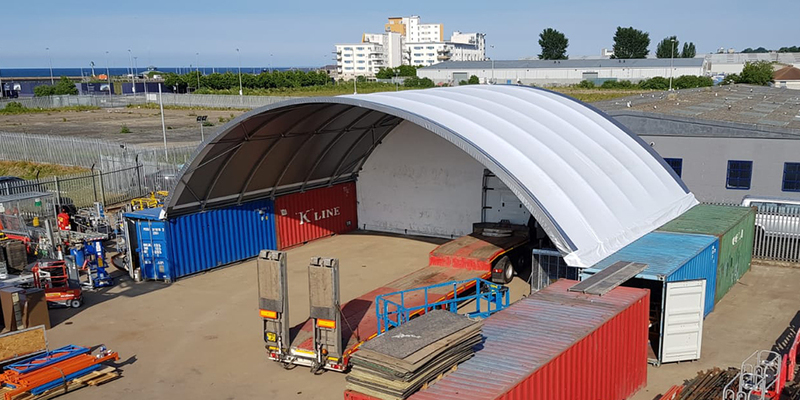 Zappshelters can withstand both wind and snow across the United Kingdom as well as considerable areas of Europe in accordance with BS EN 1993 and BE EN 1991. Site-specific structural calculations packs can be produced on request for any location across Europe. A partial end wall sits neatly in the arch opening, leaving an opening below for access whilst offering some protection from driving rain. 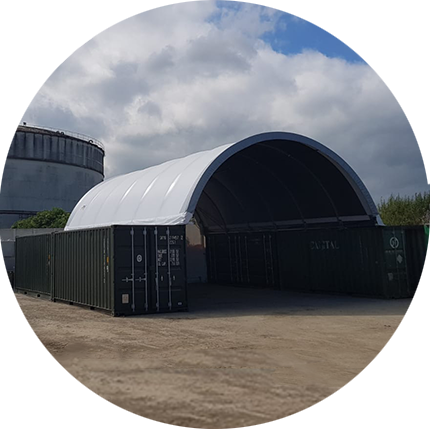 If the sub-structure has a solid rear wall across the back such as another container or a block wall, the partial end wall comes down to meet the top of this, forming a completely enclosed back to the Zappshelter. A full end wall completely encloses the rear of the Zappshelter from the highest point down to the ground, offering excellent protection from wind, rain and snow in winter, and from heat in summer. Being fabricated from the same material as the Zappshelter cover means that a full end wall allows a good level of natural daylight through. 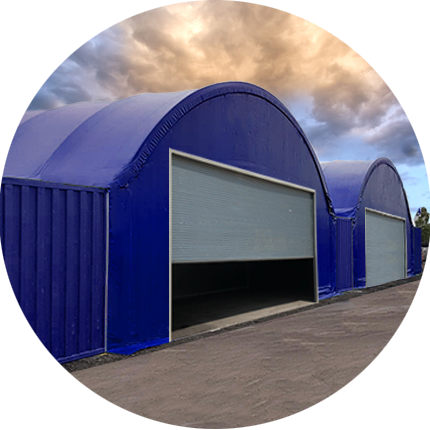 We offer two stunning doors: either our robust and versatile Zappshelter fabric roller door, or our almost indestructible steel shutter door. 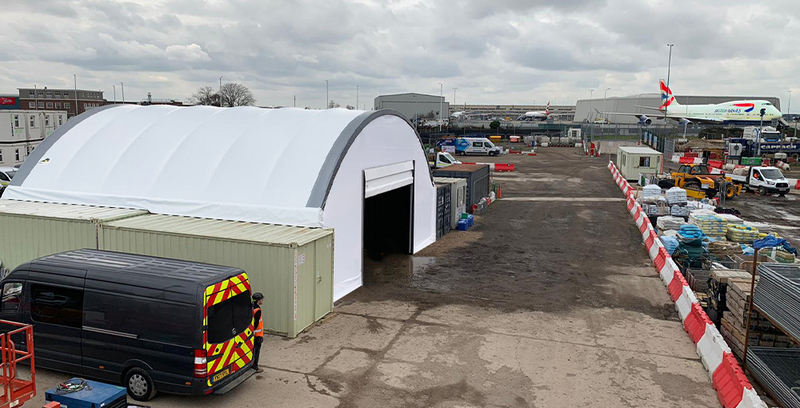 Fabric roller doors can be powered or hand-cranked and are available up to 20m x 6m in white, black, grey or a mesh, depending on the application. 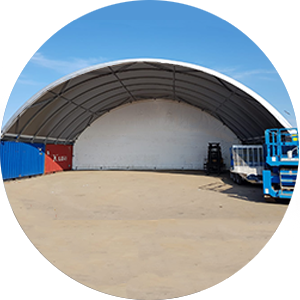 The steel shutter is always powered and can be made up to 5m x 7m. We understand that standard products don’t always suit the need. 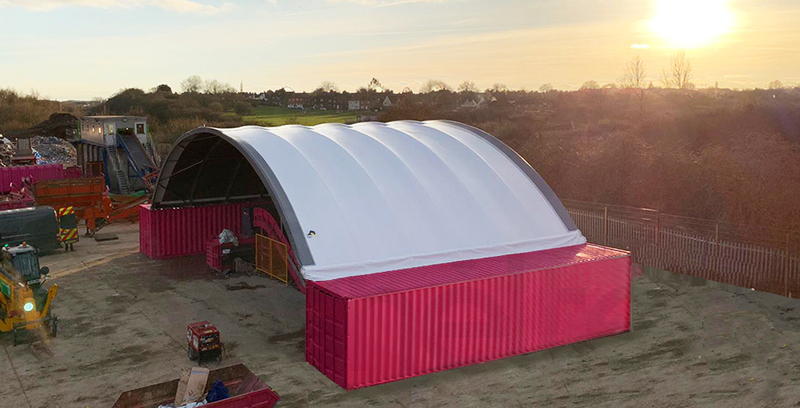 So, in addition to standard end walls and doors, Zappshelters can also be customised to accommodate openings for conveyors, ducting and machinery. Sometimes these alterations are made in the factory at production stage, but other adaptations can be made on site by our highly skilled technicians. If you need something a little out of the ordinary, just ask. There is simply nothing ordinary about Zappshelter. When you buy Zappshelter, you are making an intelligent investment into a high quality brand. From the product itself to the people behind it, it is class-leading, ground-breaking and unrivalled. It is not cheap, neither is it made in China and, when the storms come, it won’t blow itself inside out like a budget umbrella. 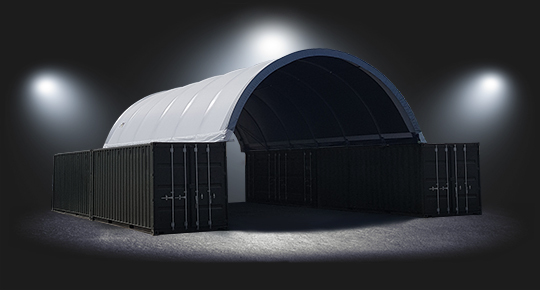 Zappshelter carries the hallmarks of a Great British company – a great product, a great brand and a great team. Why not get in touch with us today?